I was going to do one of those cute flickr photo mosaics like all the other cool knit-bloggers to show off how much I finished in 2008, so I started counting up all my FOs. Hmmm…. nine. Well that’s not really that impressive, is it? 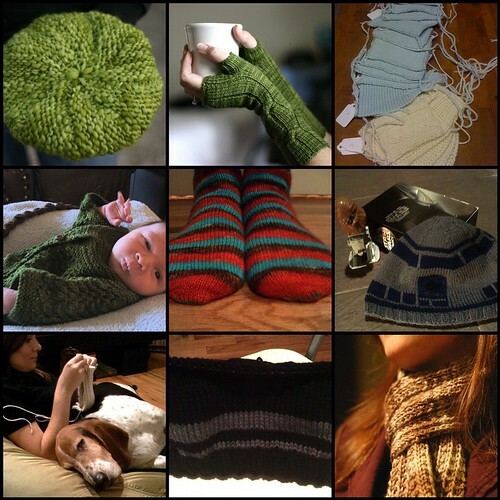 Granted, I pretty much stopped knitting from March-June due to our cross-country move. And technically, the Master Knitter Swatches could be counted individually…. You see how I snuck that last one in there? I finished the Shredded Wheat Scarf on December 17th and never blogged about it because I was waiting until we got our camera back from being repaired. Thoughts: I used much larger needles than the pattern called for in order to make the scarf even more squooshy. I really like the way it turned out and have been wearing it every day since I bound off. Soft and warm! Thermal is still progressing pretty steadily. Joey and I are taking a trip back to Texas next week so I’m looking forward to plenty of train and plane knitting time. We’re so excited that we get to spend a few days with our families and meet our new nephew! Other knitters may have more FOs, but they don’t have Henry. Or that fantastically cute new nephew. Levi can’t wait to meet you! Rylee and Easton keep asking if it’s Friday yet. Merry Christmas & Happy New Year! Ok, a little late – I hope you have a wonderful year. Your scarf is beautiful.